Why Is Angela Merkel So Popular? Angela Merkel became Europe's most popular leader by telling Germans they don't need to change, their national energy security was guaranteed, the economy was powerful – at least for car exports - and they were shielded from the stressful Club Med debt and deficit crisis that tore southern Europe apart. Also, despite it being unpopular she had shown her European credentials. Using German money, with German conditions attached she had helped save, or delay the end of, the Euro-zone. No pain, and reliable political gain for Merkel. But as Mrs. Merkel moves into her third term as Germany's chancellor, and despite the poll result hailed as a personal triumph, there are headwinds for her style of no-worries governance. Calls from her previous most-loyal business community are rising, saying she has to move quickly to confront simmering problems able to overturn the ship of state and endanger German prosperity. The problems have no problems being listed. German energy costs are high and will go on rising until the Energiewende plan is cut back and its goals pushed further into the future. Infrastructure needs and the costs of satisfying them have soared – from roads and water supply to education, health and power grids – but spending has been cut back to fund a consumer prosperity bubble. As a result the country has worn out roads, a power grid system able to black out the country on an increasing basis, gaps in health care and education that continually widen, and other needs – that can only be met by more taxes or more borrowing. Merkel's claims she can balance the budget are impossible! Meanwhile, the economy is healthy as measured by Germany's trade surplus and official jobless totals of 5.5% but its vaunted role as Europe's most industrialized nation, shown by services only providing about 71% of total GDP rather than over-80% as in other EU countries, is dangerously dependent on car production and exports. Hoped-for new industries linked to the energy transition plan have shrunk, been cut back, or plunged into bankruptcy and company wind-ups as electricity feed-in tariffs and other subsidies were gingerly cut back by Merkel's government. Competition from China also blunted German ambitions to become an export giant in the renewable energy industry. The common summary of business leaders in the Federation of German Industries, an industry group usually allied with Mrs. Merkel's CDU party is: "We're living on yesterday's reserves". Mrs Merkel is a skilled politician, and she expertly read the German mood during her 8 years in power. Now hailed as the most powerful politician, with the surest national support in the European Union, she delivered Germans what they really want: stability and the status quo. Merkel knew that the endless circus of “national economic reforms”, meaning higher taxes, lower pay, less job security and lowered public services all across Europe was something Germans had a visceral opposition to. She spelled out this strategy to her party and its junior coalition partner, the FDP, which ignored her advice. The FDP mired itself in hoped-for vote garnering human rights and lifestyle issues such as de-criminalizing pedophilia. The voters' sanction was rapid, with the FDP losing voter support in every election held since 2010, and its final humiliation, this weekend, of not even scraping the 5% national vote margin as it has previously done in every election since 1949. Not rocking the boat and floating high on past prosperity has been Merkel's ticket to power. 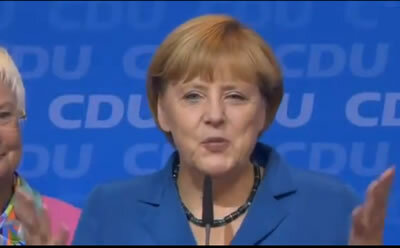 She has polished this theme in her frequent party conference speeches and media statements, where she reassures all Germans that she will keep her promise to defend Germany's prosperous stability amid the eurozone turmoil, and will use her power to prevent the collapse of the euro – despite many Germans dreaming of a return to the deutschemark. She tells her listeners that "Germany is doing well" but she will be stern with German demands for painful overhauls in Club Med Europe. Despite opinion polls close to the election showing a little erosion of her support, more than two-thirds of Germans regularly say they approve of her work, over half say she is the reason why the country is thriving despite the euro crisis, and even voters for opposition parties respond to polls about Merkel by saying she ensures stability. Unfortunately however, Merkel will have to bring in painful reforms. The longer she holds back, the more painful they will be. One change of German policy is however already clear – and will amplify. Inside the country, its economy is perceived as robust and able to remain strong, because Germany has anchored Europe against falling back into recession, but this policy has its limits. Taxpayers are less willing to continue support for crisis-stricken countries. Despite past and recent spending to support the eurozone, German exporting in Europe, not only southern Europe, are far from brilliant and some are shrinking. Merkel's argument that German bail-out aid to the Club Med countries brought more spending on German exports is less and less easy for her to claim. This means a change towards helping Germany's domestic markets, more attention to Asian markets, and a retreat from the previous “Europeanist” policy. Alongside a diffuse fear of the future which is spread across the population, Germans are reassured by Merkel's continuing, sometimes outspoken refusal to take part in “regime change adventures” such as the 2011 Libya war, and the attempted military strikes against Syria in 2013. Isolationism – rather than pacifism – is the cause of this and Merkel has judged the national mood exactly. German economic dependence on exports to its European “internal market" reflected a previous form of economic isolationism, but in her third-term as Chancellor, almost certainly with the social-democrat SDP as partner in a Grand Coalition, Germany may progressively move towards another type of isolationism – a retreat from Europe. Its national trade and economic policy, and foreign policy may change at an increasing pace. Demands for national security in Germany were translated by Merkel as the Energiewende energy plan. As I note in other articles on this mega-plan, it will certainly be reformed, toned down and made what it isn't today – sustainable – by Merkel herself. The reason is that the plan leaves business and industrial users paying about 30% more for a kilowatt-hour of electricity than the 2012 euro-zone average of 11.9 euro cents (15.5 US cents). This runaway trend of energy prices has to stop. While some German industries are able to receive major rebates and subisides for electricity, others are not, generating an increasing number of company delocalization plans and a retreat from Germany. The country's struggling banks have not yet recovered from the 2008 crisis. In some cases decades of “benign neglect” of infrastructures in which Germany investment trailed developed-world averages year after year has caused growing economic pain. The country's rigid labor laws and a population declining by over 100 000 persons per year due to rapid ageing make for sure and certain economic problems in the future. The national Institute for Economic Research said in an August report that Germany's impressive-looking financial position "is also a deceptive one." The institute' analysis of underinvestment, only in roads and transport infrastructure, ranked this at about 10 billion euros a year, about $13.5 billion. A failure to increase investment in areas like transport, power grids, health and education, the institute said, could reduce Germany's annual growth by 2017 to 1% or less from present rates near 1.6% per year. Ms. Merkel in her constant quest to reassure the nation has promised the impossible - balanced budgets – but knows that pursuing change more aggressively could undermine the cornerstone of her stability theme, and increase the national mood of isolationism. Making her post-election tasks easier – not more difficult – the electoral disappearance of the FDP, and the unimpressive scores for AfD mean that her potential for welding a Grand Coalition with the SDP is high. The SDP has criticized Merkel for moving too slowly on improving infrastructures, education and health, and for holding off changing labor laws. With the Greens and SDP, their aversion to “bold strokes” of the type bludgeoned by the UK's Mrs Thatcher is shared by Merkel. Whenever cudgel treatment was tried by Merkel it always caused her CDU to lose votes, making it possible for her to launch a little-by-little but real reform process, post-election. In her Grand Coalition, the opportunity of spreading the political pain will also be higher than it was in her second term. Also, Mrs. Merkel has cultivated her appeal across traditional party lines, building ties with labor unions, ecology and environment NGOs and womens' rights associations. Her post-Fukushima energy policy – totally abandoning nuclear power - garners her widespread cross party support despite its costs. Germany will certainly not change overnight – but subtle and powerful long term forces of change will start operating. Summarised in a single comment by Germans polled on the upcoming election, cited by newswires, Merkel is seen as “the right woman at the right place and right time" - - because “the others would probably be worse." Other European leaders, in particular France's Francois Hollande will be forced to show more respect to her new status as Europe's most powerful political leader, of its strongest economy. Due to her near-but-not-quite outright victory in Bundestag seats, her own deference to the SDP can be diluted and Merkel can push through financial and banking reforms that her CDU has mulled since the start of the Eurozone crisis. In the short-term, shown by the German Dax gauge displaying no special signs of victory euphoria, Monday 23 September, Merkel may sweeten the business community with a limited and moderate amount of direct and indirect aid. She will probably act through Germany's banking sector where major action has to be taken, soon, to stem its serious capital shortages and rein-in bad debts. The launch of an export drive is another likely initiative from Merkel, as well as the overdue reform, dilution and moderation of the Energiewende plan.